- Divide the class in two or three. 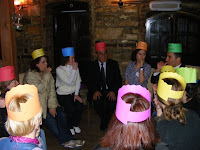 - Each student has a hat written ‘’ while I am talking … ‘’ on it , but they don’t look at their own hats. - While one student is talking the others are doing what is written on his/her hat. - While I am talking LAUGH,CRY,JUMP etc.